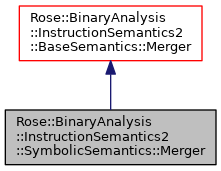 Definition at line 67 of file SymbolicSemantics2.h. Definition at line 74 of file SymbolicSemantics2.h. Definition at line 77 of file SymbolicSemantics2.h. Definition at line 82 of file SymbolicSemantics2.h. The maximum number of members in a set when merging two expressions. For instance, when merging expressions "x" and "y" with a limit of one (the default), the return value is bottom, but if the size limit is two or more, the return value is (set x y). Merging two sets (or a set and a singlton) works the same way: if the union of the two sets is larger than the size limit then bottom is returned, otherwise the union is returned. A limit of zero has the same effect as a limit of one since a singleton set is represented by just the naked member (that is, (set x) gets simplified to just x). Definition at line 99 of file SymbolicSemantics2.h. Definition at line 100 of file SymbolicSemantics2.h.